Some members of the netbook ultrasound team, with the system they built. Back row: Beth Kolko, Waylon Brunette and Ruth Anderson. Front row: Alexis Hope, Pratik Prasad and Wayne Gerard. 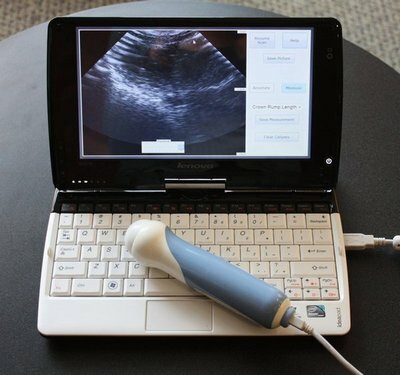 The UW system uses a handheld ultrasound probe that connects via a USB port to a touchscreen computer. The team designed a simple interface specifically for midwives. Five slider bars adjust the image settings. Four buttons control other functions, such as freezing the image or accessing the main menu. A team of University of Washington undergraduate students were among 65 research groups that today learned they had won one of the Bill & Melinda Gates Foundation’s $100,000 Grand Challenges Explorations grants. This is the fifth round of Grand Challenges Explorations, an initiative to help scientists around the world explore bold and largely unproven ways to improve health in developing countries. To receive funding, applicants show in a two-page application how their idea falls outside current scientific paradigms and might lead to significant advances in global health. Grantees, chosen from more than 2,400 proposals, represent 16 countries on five continents. The UW students and faculty are testing a low-cost ultrasound system this month on pregnant women at the UW Medical Center and Harborview. They will use the grant to travel to Africa to test their system in its ultimate capacity as a tool to increase access to ultrasound and lower childbirth-related mortality, which kills an estimated 1,000 women each day, almost entirely in the developing world. Right now students estimate their whole system, including the free software, costs about $3,500. The most expensive part is the roughly $3,000 ultrasound probe, which the group has on loan from a UW anesthesiologist. Parts could be swapped out if cheaper models become available. The effort began in the summer of 2009, when Dr. Rob Nathan, a UW assistant professor of radiology, approached Kolko. Nathan was part of a pilot project testing portable ultrasound in Uganda. He began wondering if it was the right approach. “Portable ultrasound units currently available from manufacturers range from $15,000 to $60,000, far too expensive for ministries of health or donors to consider purchasing in large numbers,” Nathan said. The devices were also too complex for most midwives to use. Last winter, Kolko’s Concepts in Human-Computer Interaction class teamed up with computer science lecturer Ruth Anderson’s course, Designing Technologies for Resource-Constrained Environments. 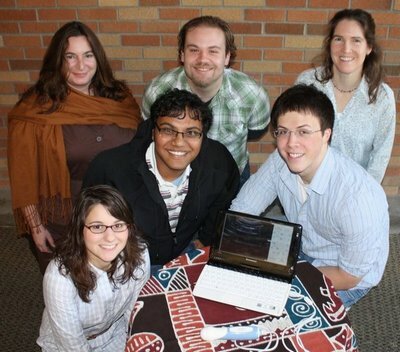 Five students set out to design a low-cost maternal ultrasound for use in the developing world. At first students thoroughly researched the medical needs, the existing technology and other groups’ attempts to deliver low-cost ultrasound. They spoke with their professors and with ultrasound practitioners at the UW Medical Center. They also drew up a survey for the Ugandan midwives working with Nathan. Their eventual concept was a modular device with a simple interface and off-the-shelf parts. It would focus on detecting three things: multiple births; breech births, when the fetus’ head is pointing upward; and when the placenta is blocking the birth canal. Midwives seeing these high-risk cases could advise the mother to deliver at a medical center rather than at home. Last spring, the concept became reality. The project evolved into a senior-level research project in computer science and engineering working with Kolko’s team. Doctoral student Waylon Brunette and professor Gaetano Borriello joined Anderson as advisers. Initial funding came from a $2,500 undergraduate research award from the College of Engineering. “We came after this not just as a technology problem but as a human problem. We were really able to innovate that way. And I think that’s been the missing piece in other low-cost ultrasound projects,” Kolko said. More graduate students in the human centered design and engineering department have joined the group this fall, many using the project to earn research credits. This month’s preliminary tests in Seattle will be the first time the device is used to image a fetus. The students also are writing a help system and preparing for the field test in Uganda. The group will present its research next month in London, England at the Symposium on Computing for Development, which focuses on computing applications for the developing world. Other members of the core team are Matthew Hicks, a senior in informatics and comparative history of ideas; Pratik Prasad, a junior in computer science and mathematics; and Nicole Goldsmith, a clinical ultrasound instructor at UW radiology. For more information, contact Kolko at 206-650-0120 or bkolko@uw.edu and Nathan at 206-769-3842 or ronathan@uw.edu (Nathan will be leaving town for 10 days on Friday, Nov. 12). Contact Hope at 425-417-3453 or alexishg@uw.edu and Gerard at 206-491-2399 or wayger@uw.edu. More about the research is at http://change.washington.edu/projects/mobile-midwives-ultrasound/.